Since we were a child, giant sequoia trees have held a great fascination for us. Several years ago, we saw some giant sequoia trees in small containers at our local botanical garden, and decided to try to grow them. They grew fairly well potted inside our apartment, but each and every one died during transplanting outside. Even with frequent watering, the roots seemed to dry out and we were left with a dead tree. This continued for several unsuccessful attempts, that is until we planted our first tree with a device we read about online - the Groasis Waterboxx PlantCocoon. We planted this tree with the Waterboxx, watered it once, and never watered it again. The tree not only survived, but thrived, and is now growing without the Waterboxx or any other intervention. We wanted to make sure this success wasn't a fluke, so decided to plant another sequoia, this time somewhat farther to the south, and transplanted at an earlier age. Below, you can see the results of this test planting. The following photos will document the whole growth of a sequoia from its initial planting outside to removal of the Waterboxx. 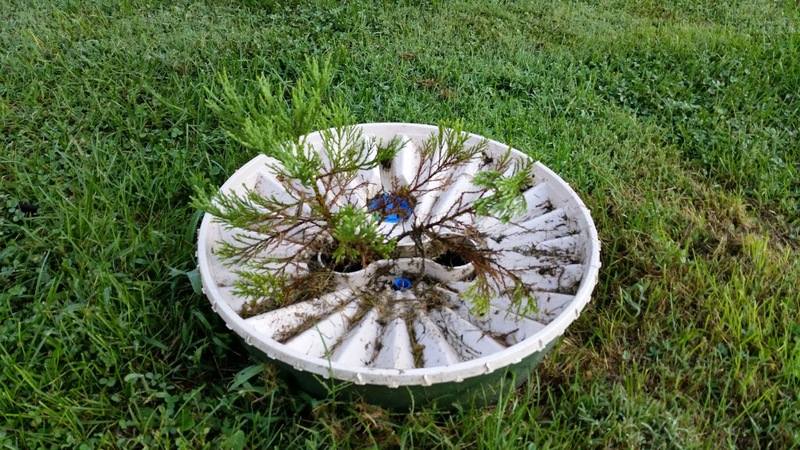 A small sequoia barely sticks out of the central opening of the Waterboxx on July 3, 2013, the day of its planting. The same sequoia on August 24, 2013. Already after 6 weeks you can see significant growth with even the limited light reaching the central opening. It has not rained for approximately 2 weeks as of this photo. As the sequoia was so small initially, it had a great deal of trouble getting enough sunlight for rapid growth. 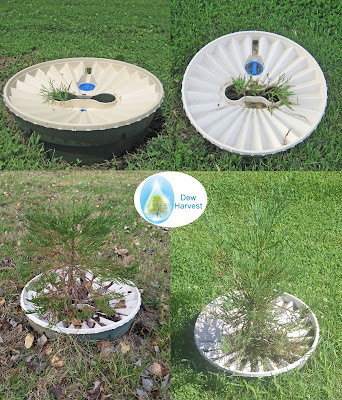 However, as more of the sequoia needles reached above the Waterboxx lid, the sequoia began to grow more rapidly. Remember, we never added any water to the sequoia or the Waterboxx after planting. Here you see the approximately doubled in size Sequoia on September 7, 2014 (with some dried grass on the Waterboxx lid). The same sequoia on August 13, 2015. This tree has dramatically filled out, and we will be able to remove the Waterboxx PlantCocoon after the winter. 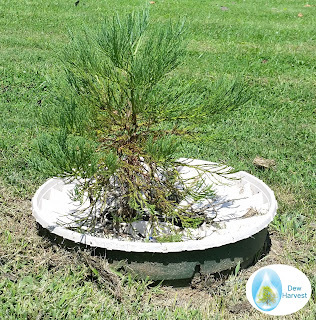 The tree will then be able to grow without watering due to its deep, Waterboxx induced root system. 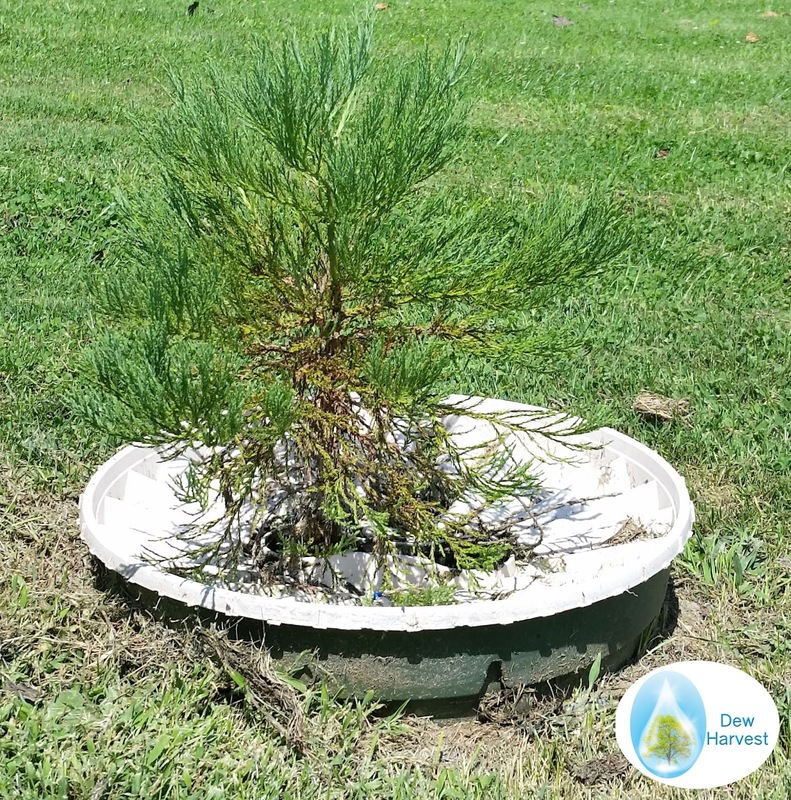 3 Years' growth of a sequoia - from tiny sapling to 2 foot tall tree - no water was ever given to the tree and the Waterboxx was left in place over winter. As long as the central dumbbell shaped opening is oriented along an East-West Axis, then the seed or small tree will get enough light to grow. The Waterboxx cost 7 million dollars to develop, and works so well because of its multiple ingenious features. It funnels dew into the central basin, and then allows that to drip to the roots of a growing plant. You can buy the Groasis Waterboxx PlantCocoon here.. We buy our giant sequoias from Giant-Sequoia.com.